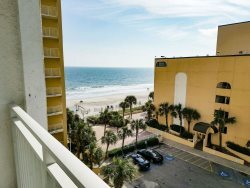 2 BR/ 2 BA angle oceanfront condo! completely renovated condo with amazing ocean views! Come enjoy this angle oceanfront 2 bedroom, 2 bath unit with 2 private balconies!! Located on the 22nd floor with a completely unobstructed view! It's located on the north side of the building, meaning you get the PERFECT sunrise over the ocean. The master bedroom features a queen bed, with private bathroom. The master bathroom has been recently remodeled with beautiful tile work and a shower/tub combo. The second bedroom features a queen bed with a private balcony overlooking the city. Not an early bird? This means you can also enjoy a sunset over the city! The guest bathroom has been remodeled and has a stand-up shower. Each bathroom comes with 8 towels, 8 washcloths and toiletries. The kitchen includes all necessities such as a coffee pot, toaster, pots, pans, all cooking utensils, plates, glasses and silverware! The living area hosts a sleeper sofa, making this condo sleep a total of 6 guests! Must be 25+ to book! PLEASE NOTE: The Palace Resort is currently completing an exterior project that will take place until the end of April 2019. Our City View balcony is complete and you will have access to it. However, our Oceanfront balcony is currently being worked on. Guests will not have access to it. There could be noise and odors that affect your stay. Pools and amenities may also be affected. If given advance notice, we may be able to give you pool access to another place. We apologize for any inconvenience but because you are being forewarned, there will be no refunds given. Our prices are already marked low due to this. this property is located right on the beach. Has 5 hot tubs including on the floor of the condo. Beach access is super easy with great sand (not too many shells) and easily accessible to Wal-Mart and some restaurants. Little ways down from the Boardwalk and Broadway at The Beach. Room sizes and bathrooms were great. Kitchen comes with some basic supplies. There is a smart TV, too! Highly recommend this location. It was fantastic for a week in Myrtle Beach. The building the condo is was being renovated and is a little older, but the condo itself is simple & updated. This was a nice condo the view was amazing! Right on the beach. Close to restaurants and entertainment. Accommodations were nice but bring your own hair dryer. I would recommend this property to friends.